The table of job growth by sector over the past year - link to Statscan table - illustrates the problem. The private sector created 97 thousand jobs in 2014 (plus 55 thousand self-employed), while the increase in Construction grew by 69 thousand (note that I have rounded off all numbers to the nearest thousand). It is clear that Construction remained the main engine of job creation within the economy, although it is supplemented by the ongoing growth of the health sector (which is government dominated within Canada). The chart above shows trends in the sectoral breakdown of employment since 1980 for a few key sectors. Construction has increased its share of employment since the 1990s, when the economy was recovering from a previous housing and condo bubble bursting. 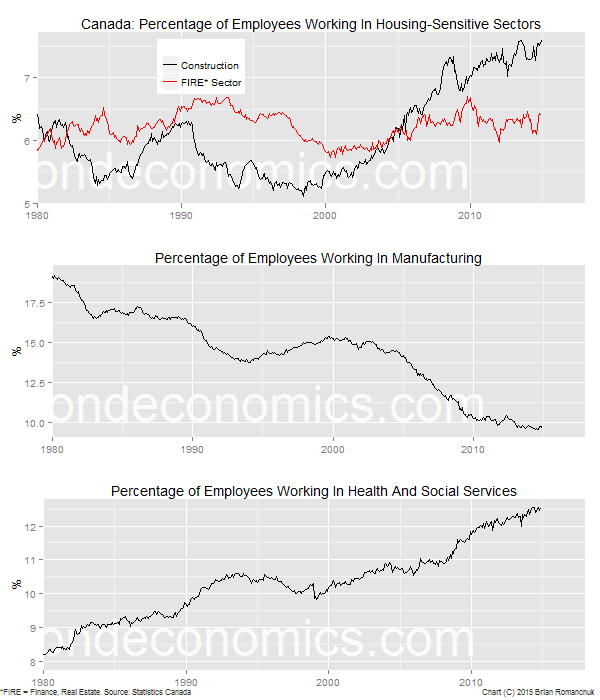 Manufacturing employment has collapsed since 2000, confounding the hopes of the economy bulls. Those losses were offset by the structural rise in Health and Social Services. The oil and gas sector is not a major direct employer, but the jobs created are well paying and concentrated in Western Canada. So far, there has been only limited job losses, but the cuts will start if oil prices remain near current levels for more than a few months. Additionally, the investment in physical plant will be cut back, which will rebound upon manufacturers, primarily in Eastern Canada. There has been a slight pullback in housing starts (chart above). Lower starts should tend to dampen the growth in Construction employment, but as long as projects are not abandoned, outright job losses will not occur for some time. 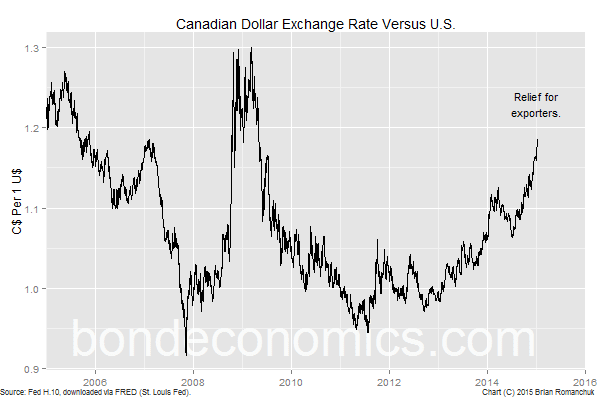 The rather rapid depreciation of the Canadian dollar should allow for rebalancing within the economy. In addition to exporters becoming more competitive, imports are more expensive and so there may be substitution away from foreign suppliers. Based on past experience, the impact on Canadian consumer price inflation will be muted; exchange rate moves are typically absorbed within profit margins. Additionally, the fall of gasoline prices benefits consumers across the country, although this will not buoy spirits in Calgary. The question is: can Canada avoid the messy unwinding of its housing bubble that was experience in other countries? Differences in how mortgages are financed means that the banking system should avoid a crisis. However, the real risk is in the labour market. Construction job losses will have a multiplier effect, dragging down demand-sensitive sectors like Retail. Finally, health spending is under the control of Provinces, which have much larger economic footprints than American States, but do not have direct access to the central bank. The Canadian financial press worships at the altar of fiscal rectitude, and a pro-cyclical fiscal tightening is highly possible. At present, all one can safely say is that the downward spiral has not yet started. Unless the economy makes a very dramatic downturn, there is little reason to expect policy changes over the coming year. The Bank of Canada is unlikely to move rates in either direction in 2015. If the Fed hikes rates, the Bank of would only follow with a lag. This would put the earliest rate hike in 2016, and we will have another year's worth economic data to digest. Going the other way, there is almost no scope to cut rates. A token cut of 50 basis points is possible, but the Bank of Canada has found that zero rates is not compatible with a proper functioning of the Canadian money markets. Fiscal policy is unlikely to be helpful, although the Federal Government may decide to loosen the purse strings ahead of an election. (Although the Conservative Party positions itself as fiscally conservative, they were certainly Keynesian during the financial crisis.) Analysts are now giving up on forecasts of a Federal fiscal surplus, which is what I said would happen last year in "Canada: Enjoy The Projected Surpluses While They Last". The real risk is that Provincial governments will be forced to tighten policy, but that would not happen until after there is a visible downturn and their deficits blow out. 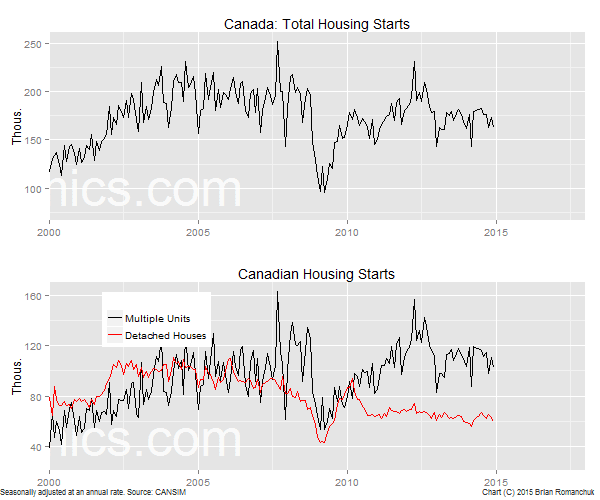 The constant question investors face is: how to position for a Canadian housing market downturn? There may be some possibilities in the equity market, but that is an area where I have little expertise. 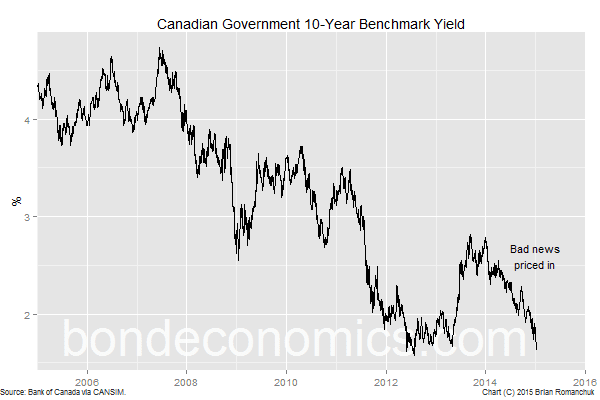 With regards to fixed income or the currency, the trade was to buy bonds or sell the Canadian dollar (as the charts above show). At this point, considerable bad news seems to be priced into these markets. Although these trends could continue if the Canadian economy goes further into the tank, there is much less margin of safety in pricing. Additionally, currency weakness and lower interest rates are self-limiting: both will tend to stimulate economic growth. The structure of the Canadian mortgage market is such that major dislocations in the credit market appear unlikely. There does not appear to be the equivalent of the "subprime short" trade. That said, I am not a credit analyst, and I no longer have contact with that market, so readers should understand that I have limited conviction about that opinion.